On Tuesday, President Obama released his fiscal year 2015 budget proposal, calling once again for significant new and ongoing investments in high-quality early education and care. The proposal closely mirrored his 2014 budget proposal for preschool. [Congress did not fund that proposal in full, but did include funding increases for early education in the final FY14 budget]. The President’s FY15 budget request includes $75 billion over 10 years — starting with $1.3 billion in 2015 — for mandatory funding for a Preschool for All initiative for four-year-olds. The budget also includes $750 million for competitively awarded Preschool Development Grants, as well as increases for Head Start, home visiting, and the Child Care and Development Block Grant, according to the U.S. Department of Education. The Preschool Development Grants build upon the progress made this year. As part of its Consolidated Appropriations Act of 2014, Congress included $250 million in funding for the grants. This new initiative would award competitive grants to states to build their capacity to develop, enhance, or expand high-quality preschool programs for children from families at or below 200% of the federal poverty level. An RFP is expected later this year. The proposal also includes a 10-year, $15 billion investment to expand voluntary home visiting programs, which would be funded, like Preschool for All, from the proceeds of a new federal tobacco tax. In addition, the president’s proposal funds Early Head Start-Child Care Partnerships to provide high-quality infant and toddler care for more than 100,000 children. Covering the release of the budget, U.S. News & World Report quotes the president. To learn more about the president’s budget plans for early education, visit the U.S. Department of Education website and the National Women’s Law Center. An overview of the president’s full education proposal for FY15 can be found here . In addition to the FY2015 budget, early education is also on the Congressional agenda through the Strong Start for America’s Children Act and the reauthorization of the Child Care Development Block Grant. 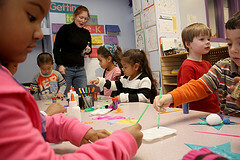 Stay tuned for any federal updates as they develop and be sure to follow us on Twitter @EarlyEd4All.